This monthly article features useful information about Dilithium, including what it is, how to earn it, and how to use it in-game. We’ll be featuring this article monthly, and adding to it as more questions about Dilithium arise. Beginning with the launch of Season 5: Call to Arms, Dilithium has become the major form of currency in Star Trek Online – it is primarily used to purchase in-game items, including ground and ship gear, starships, select Duty Officers and crafting materials, and is used to begin some Duty Officer Assignments. With the launches of Season 6, 7 and 8, Dilithium is also used in select Starbase, Embassy, Dilithium Mine and Spire Fleet Projects. Dilithium is primarily earned by completing in-game missions (PvP and PvE dailies, events, STFs, Duty Officer Assignments, spotlighted and qualified Foundry missions, etc. ), and is awarded as Dilithium Ore. Players can also go mining for Dilithium Ore once per day on the Vlugta Asteroid Field, near Deep Space Nine, in the Beta Ursae Sector Block. Before this Ore can be spent, it must be refined. Players are able to refine up to 8,000 Dilithium Ore per day – 800 Day Veteran subscribers also have access to a special Duty Officer Assignment on Starfleet Academy (Fed), Klingon Academy (KDF), and New Romulus Command (Rom) that allows for extra Dilithium refining (1,000 extra for a 48 hour assignment). Gold members also have a special perk that allows them to refine Dilithium automatically upon logging in, up to one previous week’s worth. Also, the recent introduction of the Fleet Dilithium Mine Outpost has added more benefits for earning and refining Dilithium! Check out the full details on this new addition here. STOWiki.org has done a fantastic job creating a Dilithium information page that provides a full list of missions that award Dilithium, including amounts. You can check it out here. Refined Dilithium is also available via the in-game Dilithium Exchange, which can be accessed via the downward arrow on the mini-map. Here, you can exchange ZEN you’ve transferred into STO for Refined Dilithium, and vice-versa. It’s important to note that the Dilithium Exchange is a live marketplace – exchange rates are driven by the playerbase, depending on how much of one currency they are willing to trade for another, and such rates may fluctuate from moment to moment. How do I use Dilithium in-game? As mentioned, once Dilithium Ore is refined, it becomes a spendable currency. Many ships in-game require Dilithium to be purchased. Federation players can find Starship Requisitions at Earth Spacedock, Deep Space 9, Deep Space K-7 and Starbase 39-Sierra. Klingon players can find Starship Requisitions in the orbiting shipyard of Qo’noS. And Romulan players can find Starship Requisitions at the hubs of their allies, New Romulus Command, and the Flotilla. Players can also buy many different types of ground and space gear from various vendors across the galaxy. Federation players will find that Earth Spacedock is home to vendors who take Dilithium, and Klingon players will want to visit Qo’noS to spend their Dilithium. Romulans can visit vendors on the hubs of their allies, in addition to New Romulus Command and the Flotilla. Gear can also be purchased directly from the Dilithium Store on the minimap. If you are looking at crafting higher tier items at Memory Alpha, most recipes call for Common and Uncommon Unreplicateable Materials. These are purchased with Dilithium and can be obtained from a vendor on Memory Alpha (Fed), Qo’noS (KDF), or New Romulus Command (Rom), or through the Dilithium Store on the minimap. Select Duty Officers can be purchased with Dilithium from Lt. Ferra at Starfleet Academy (Fed), Lt. S’stas at Klingon Academy (KDF), and Centurion Velaar at New Romulus Command (Rom) – these Duty Officers are of Uncommon/ green and higher quality. As you participate in various Duty Officer Assignments, you will notice that some of them will require Dilithium. Similarly, Season 6: Under Siege introduced the new Fleet Advancement System. While some of the Starbase Fleet Projects your Fleet Officers decide to undertake may require large amounts of Dilithium, you can choose how much you would like to contribute at a given time – this allows for multiple fleetmates to contribute smaller amounts at a time if they wish. For those players that would like to “thank” the author of a Foundry mission you’ve recently enjoyed, at the end of the mission, along with your review, you can choose to leave a “tip” of refined Dilithium. Among other things, this helps authors fund the purchase of additional Foundry project slots, which means more Foundry missions for you to play! How do I use the Dilithium Exchange in-game? To access the Dilithium Exchange, click on the downward arrow on the mini-map and select “Dilithium Exchange” – this can also be accessed while browsing the Dilithium Store for items and clicking on “Buy Dilithium”, and through the button on the “Assets” tab of your inventory. Again, it’s important to note that the Dilithium Exchange is a live marketplace – exchange rates are driven by the playerbase, depending on how much of one currency they are willing to trade for another, and such rates may fluctuate from moment to moment. E: Once you have entered the information in the fields above (D), click the “Submit Offer To Buy” button to confirm and submit your offer to buy ZEN. When you enter a buy ZEN offer, all the dilithium for it is taken from you immediately. If you get the ZEN for a cheaper price, or you withdraw your offer before it is completely fulfilled, you get that dilithium back. NOTE: ZEN purchased via the Exchange are bound to Star Trek Online. If there are not existing sell offers that match your quantity and price, you might get part or none of your order, and it will be fulfilled later when there is a matching sell order. 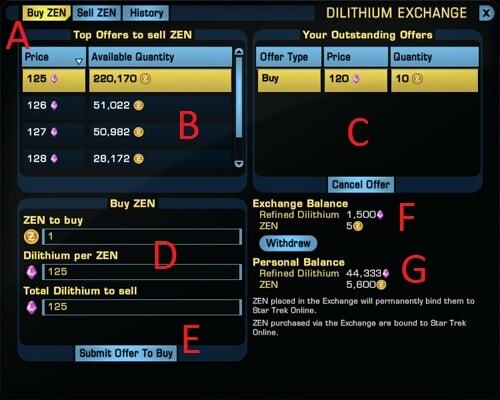 *If buying ZEN, the Refined Dilithium price must be set between 25 and 500 Refined Dilithium and offers must be set to at least 1 ZEN and no more than 5,000 ZEN. If selling ZEN, offers must be set to at least 1 ZEN and no more than 5,000 ZEN and the Refined Dilithium price must be set between 25 and 500 Refined Dilithium.